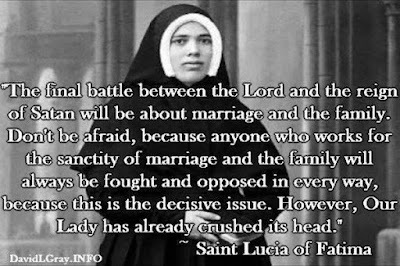 TradCatKnight: Fatima: "Final Battle About Family & Marriage"
Sister Lucia: "...the final battle between the Lord and the reign of Satan will be about marriage and the family. Don’t be afraid, she added, because anyone who operates for the sanctity of marriage and the family will always be contended and opposed in every way, because this is the decisive issue. 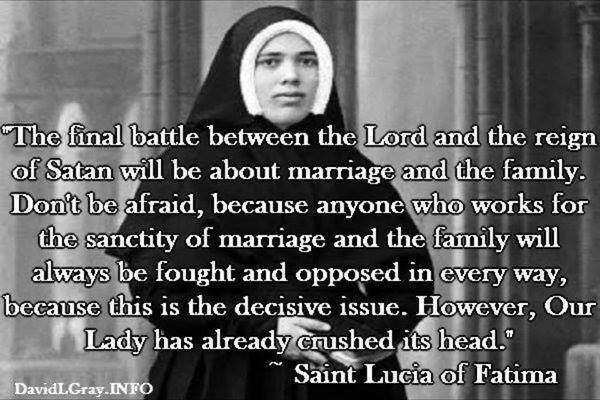 And then she concluded: however, Our Lady has already crushed its head." And the tip of the spear in that battle has been Feminism. Which of course is an extension of Marxism. The ideology that uses perceived inequalities to divide societies against itself. With Feminism it cuts across all races and religions. Unfortunately once women become infected with the poison the self destruction becomes inevitable.